Our smokey black glass is a sophisticated choice for any inventor. Beveled edges bring uniqueness to this geometric optical crystal plaque which rests on a cut edge for added impact and style. This dynamic award stands as a reminder of your inventor's accomplishment. Available in five popular layouts including an option to create your own design. Layout one is not recommended due to size. 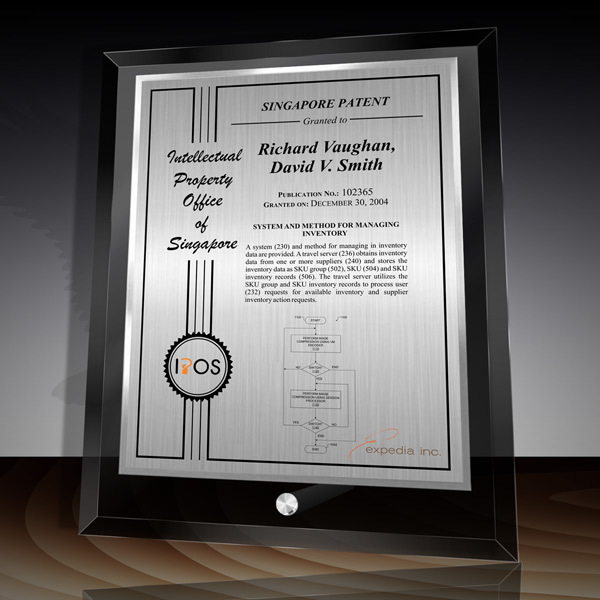 Patent information is HD printed on a silver metal plate and accented with a silver trim. All plaques include satin silver hardware for easy desk or table displaying. 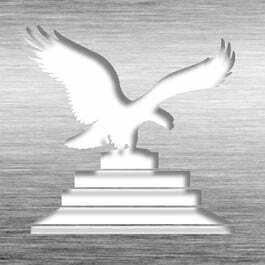 This Patent Award - Glass Desk Plaque Black DG-10EZ is part of our Patent Desktop Award Series of products, check out other products & options available in the Patent Desktop Award Series of our selection. This Patent Award - Glass Desk Plaque Black DG-10EZ can be modified to your requirements and is available for your corporate award programs.